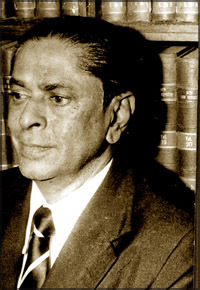 Twenty Five years ago - on September 22, 1983, Ainsley Clive de Zoysa, popularly known as ‘Bunty Zoysa’, Criminal Lawyer, President’s Counsel, a gentleman, fearless, forthright and brilliant Lawyer died suddenly. He will be remembered forever and live in the minds of multitude of friends, relations colleagues and others who knew him, loved him and respected him for what he had done during his 60 years. He was the youngest out of six sons of Francis de Zoysa - Kings Counsel, Member of the State Council for Balapitiya, freedom fighter during the British Colonial days, and for some time, The President of the Ceylon National Congress. He studied at Royal College, Colombo, and also at St. Patrick’s college, Jaffna, when his elder brother Sidney de Zoysa was the Superintendent of Police, Jaffna. At Royal he was a mischievous rebel and had various problems with the authorities. At the time of leaving the school, then Principal, E. L. Bradby had written in his certificate “He paid very little attention to a quiet life in school and was often involved in trouble with the authorities. But the very qualities of enterprise and initiative which got him into trouble should stand him in excellent stead if he finds the right job”. Mr. Zoysa was born in 1923 and took oaths as an Advocate in 1949. Nearly two years he was practising as a Junior to Dr. Colvin R de Silva whom he held in the highest esteem on the criminal side and E. G. Wickramasinghe K. C. on the Civil side. He had joined the Attorney General’s Department as a Crown Counsel in 1951, on the invitation of Sir Allen Rose, the Attorney General then. In no time he proved his capabilities and got the opportunity to oppose well-known veterans in the filed of criminal law, like G. G. Ponnambalam K. C. George Chitty, Q. C., R. L. Perera, K. C., and Dr. Colvin R. de Silva, when he led prosecutions on behalf of the State. As a prosecutor he earned such a great name in no time and the general feeling around those days was that if Mr. de Zoysa is prosecuting the defence should retain an eminent lawyer like Ponnambalam, Colvin or Chitty. As the then Chief Justice Neville Samarakoon Q. C. said at the Supreme Court reference, after his demise, “Mr. A. C. de Zoysa - Bunty - had to shoulder some of the island’s heaviest criminal prosecutions, soon after he joined the Attorney-General’s Department in 1951. He was pitted against some of the leading lights. At 5 PM on the 22nd of September a memorial service was held in the memory of A C De Zoysa President’s Counsel who passed away exactly twenty five years ago. A casual visitor to the church that day could be pardoned for assuming that the requiem was in the memory of a recently departed person of great eminence. St Theresa’s Church, one of the largest in Colombo, even at that difficult hour was filled with friends and relatives obviously still struggling with the void left by his death. To those who had the good fortune to be associated with him the mere mention of the name “Bunty De Zoysa” would answer that question. Much has been said and written about Bunty, that great legal personality. Pondering these fulsome salutes we picture in our minds a many faceted man, larger than life. Fearless, brilliant, eloquent, generous, witty, large hearted are some of the adjectives commonly used in describing Bunty and his doings. But words often fall short when describing a complex human being and more so when our perception is influenced by strong emotion. Twenty five years is a long time in human affairs. That after such a length of time there was a church full of people thankful for his memory is perhaps the clearest description of the meaning of Bunty’ s life. All those people came there not because of some organizational imperative or a pressing need to gain political mileage, but through a genuine commitment to pay homage to him. They had all been touched in some special personal way at some time in their life by Bunty. He was always immaculately dressed and ever looking younger. He had a fine taste and elegance in his speech, in manner and also in conduct. His fine taste and elegance and sense of life combined a zest for commitment and whatever he did, he cut a special figure. At a time when Attorney General Department had lost some of its lustre Mr. Zoysa made an art of criminal prosecutions, in the way he presented his cases, the felicity of the spoken work and the strategies he employed in examination in chief, cross, examination, and also in re-examination without leaving any room for anyone to complain of any unfairness or ethical shortcomings on his part. He had always been careful about fairness in all his dealings. When he was in the Attorney-General’s Department he prosecuted several landmark criminal cases. C.W.E. Robbery case, Pauline de Croos - Kirambakanda Case, Kularatne murder case, Attygalle Nurse murder case, are some of the leading cases. But anyway for him promotions were denied on merit. Therefore he along with Mr. H. L. de Silva resigned from the Department and joined the unofficial Bar in 1970. There again he moved to the front ranks of the unofficial Bar in no time, as law came to him like a tradition and his advocacy has been a legacy from his father Francis de Zoysa K. C.
In his study there was another framed picture which carried the inscribed legend “Please, I can do only twelve things at a time”. In a way it was no exaggeration considering the daily demands on him in various matters not nearly about professional work. Those days No. 54, Cotta road was like the O.P.D. People from all walks of life came there for help, not only lawyers, friends and known people but even unknown people who had no connection with him. He was generous to a fault. By nature he was a giver. Not only to the people from Ragama or Balapitiya for that matter whoever who came with a story probably he could see through the veracity of it but he gave generously and well for the asking for it, even for the people not known to him. He had many Juniors. The Juniors and the apprentices he looked after well and treated them very well. We can say he has been such a senior, very rarely junior lawyers will come across. He was so pleasant and so friendly to all. His chambers was one of the busiest in Sri Lanka, and his juniors came to bear that special stamp that Mr. Bunty de Zoysa’s. There were a large number of junior lawyers from various parts of the country, who did apprenticeship under de Zoysa were Present Attorney General - C. R. de Silva - President’s Counsel, Justice Sarath de Alrew, Minister Bogollagama and many others. He had a natural flair for making friends. It was so evident when he was persuaded to stand for election as the President of the Bar Association. He mustered unsolicited support from every conceivable shade of political colour and all corners of the country. He has functioned as a Director, of Bank of Ceylon from 1977. There, being a member of the Board of Directors of Bank of Ceylon, contributed substantially towards its evolution into development banking which was so essential for an open economy and a free enterprise system that was introduced by the new government of 1977. Like his illustrious father, after about 4 decades Mr. de Zoysa had to do a very special job before the Special Presidential Commission as its chief prosecutor leading the State team. His condemnation of corruption and abuse of power, was loud and clear, the country saw it. It was a challenging task only a few almost equal to Mr. de Zoysa could alone have done, but he did it so well. His sparkling phrases, an unmatched fluency of diction, and a cavalier Courtroom manner, all embodied to make the opening address before the Special Presidential Commission the classic social document that it has been hailed to be. We who watched it being delivered, felt obviously the courage he had, a commitment to truth, and undoubtedly the rigid responsibility of a prosecutor ensuring a fail trial. His good relationship with various groups of people amply demonstrated in an incident that took place on his last journey at his funeral procession. There were three little standard-bearers who were in the forefront of the procession while furling a cross in his hand the smallest of them asked the big one as to what he was supposed to do with the cross. He also said, “I dont know. Anyway my father is a Communist”. His fragrant memory will remain forever in the minds of all those who associated with him.